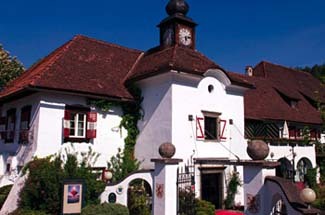 Schloss Leonstain is the second castle in the area to bear this name. The original castle lies in ruins to the west of the town (and may be visited). This new Schloss Leonstain was built in the late 15th-century as a more livable structure for the local nobility. Ownership passed in 1645 to the Jesuits, who ran a beer brewery on the premises. Emperor Joseph II later confiscated all Jesuit property, with the Crown eventually handing Leonstain over to the Benedictines. In 1910, Dr. Carl August Neuscheller, knight of the Franz Josef Order, bought the castle, and today the fourth generation of his family manage the hotel. Johannes Brahms composed the Symphony in D-flat, the Concerto for Violin, and the Sonata in G-flat, while residing at the castle during the summers of 1877 and 1878. A section of the resort town of Pörtschach sits on a tiny peninsula on the north shore of Wörther See—one of many Carinthian lakes warmed naturally by thermal springs. The town comes alive in summer with visitors who love to splash around in the lake, enjoy water sports, and just relax. A late afternoon stroll along the flower-lined promenade around the lake shore is a delight. The half-board option at Leonstain is a great value. Pörtschach is served by both train and bus. The hotel is along the main highway. Although Leonstain is a modern resort, many medieval castle touches remain: vaulted ceilings, half-timbered walls, a charming courtyard, and decorative wrought-iron pieces scattered about. The hotel is not located directly on the lake, but a footpath will take you to a private beach and dock where you can take a canoe out to explore the area. Rooms are varied in size and decor; the duplex suites have sitting rooms with bedrooms tucked under the ceiling eaves; framed musical scores decorate the antique-filled Brahms Suite. During the summer months you can enjoy a candlelit dinner served outside in the lovely Renaissance-style courtyard.